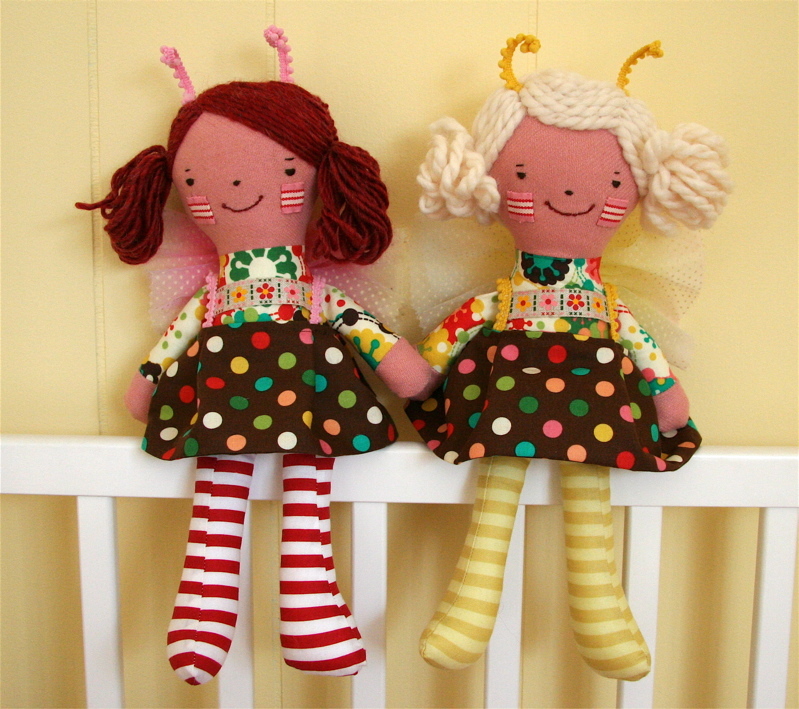 I’ve had many ideas for birthday gifts for the chicklets, Sadie and Delia. But what do you make for the daughters of the craftiest mom of them all?! I dismissed so many ideas along the way that these presents are now far beyond belated-birthday and are falling in Christmas territory. I was finally spurred into action on this latest idea after being handed down some pastel rainbow dotted swiss and reading about S & D’s love of fancy and flashy fairies. I hope these are acceptably bedazzled! On the fairy topic…while I was working on these gals last night I kept chuckling thinking of this too funny take on the flashiest of all fairies, the princess fairy. For some reason your whole archive came up on my Google Reader so I got a look at your work from way in the past. 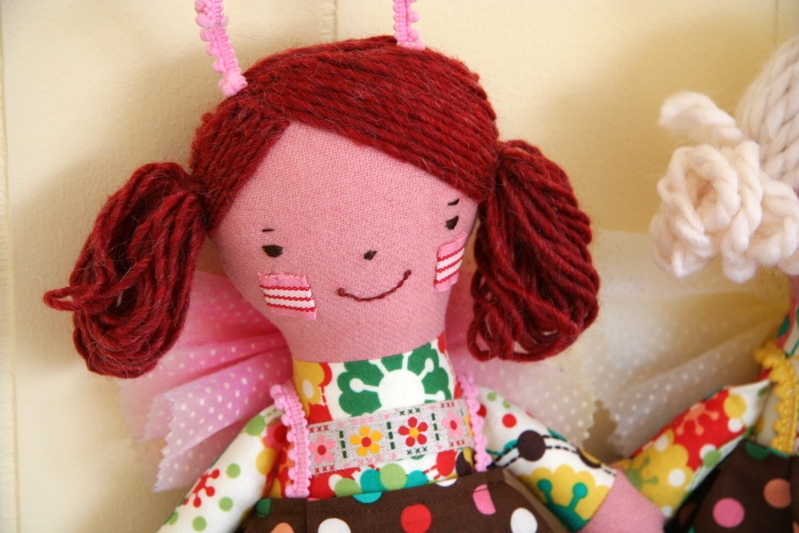 Your dollmaking just gets better and cuter all the time! So adorable! I recently used that exact same polka dot on a project for a friend’s baby (see http://www.flickr.com/photos/amyandthomas/2099412499/ ). Looks great on your fairies! holy crap- these are the cutest little fairies ever! i totally want one too. i love the little antennae!! maybe if the girlies don’t like them they can pass one on to me (hehe- reminds me of amy’s funny gift tags she just posted). Yep I too had 52 times hillary in my reader I almost was glad you didn’t craft 52 things in a day that would be insane even for you..
About the princess fairy story you linked to… where do you *find* these things? Cracked me up. But anyway, I like the fairies you made, the hairdos are just the best. Gorgeous dolls as always! Love that rainbow dotted swiss! Oh my goodness! Perfectly perfect! Oh my gosh! Outrageously cute. I have always said that no one does cute as well as the Japanese,but I think that you’re a close second! these are too fantastic!!!!!!!!! i think the absolute BEST touch is the “who-ville” antennae. Oh, these are just too cute. Have you ever considered doing a “hair” tutorial? Your hairdos are always the BEST! You always seem to have a new and exciting way of making hair on your dolls. Do you come up with them yourself or is there a good resorce for hair you could pass on? really fantastic dolls, as always. Oh my gosh…these are adorable! Those little girls are going to freak out when they open them! The little wings are too cute..and their hair! My goodness! your dolls are so inspiring. great job! i think i’d love one as much as my daughter. . .
Lucky Birthday girls! They are going to be so happy! Those are just adorable! I love the way you have done their hair. And the dots with the stripes is just too cute. that dotted fabric is wonderful…I think I need to buy some more! These are perfect! I am sure that Sadie and Delia will adore them! I really love how you treat the hair – it’s great. I’m jealous, I WANT ONE! They are ADORABLE!!!! amazing!! and so generous, thoughtful, sweet and just heart warming. you are such a dear friend and amazing crafting partner in crime-thank you so much. they hurts. . .
and the antennae?? are you insane? super genius cute!! Those are the Best Ever. I love them. Just perfection! They have such wonderful expressions. And those outfits… to die for. They are both AMAZING!!!! I especially love the polka-do fabric! Oh my goodness! These are too freakin’ cute! I am so jealous of your talents. How I wish I could whip up such cuties for my girls. I have not been blessed by the crafting goddess, but have been given three daughters… However, I pathetically try. S and D will adore them! Thank you for sharing. Wow, these are adorable!!! How do you do it?!?!?!?!? OMG, those are so awesome. You have a way with the yarn. The dolls are adorable and the hair, wow. Oh these are the bestest! I need to have a daughter to make fairies for. The hair is so wonderful. I don’t have this kind of skill at all. Yep, it’s the antennae to be sure! You are so uber talented it kills me! I think those might be my favorite thing yet! I love all the fabric you picked out. OMG!!! They are just too cute. You did these last night? Sooo, is a pattern for sale in the works, here? Please make a pattern for your shop-please,please,pretty please! These are perhaps the cutest thing you’ve done–tied with the stitchettes, actually. I think these are my all time favorites of all your softies thus far. Those cheeks! That hair! Those antennae! The fabrics! 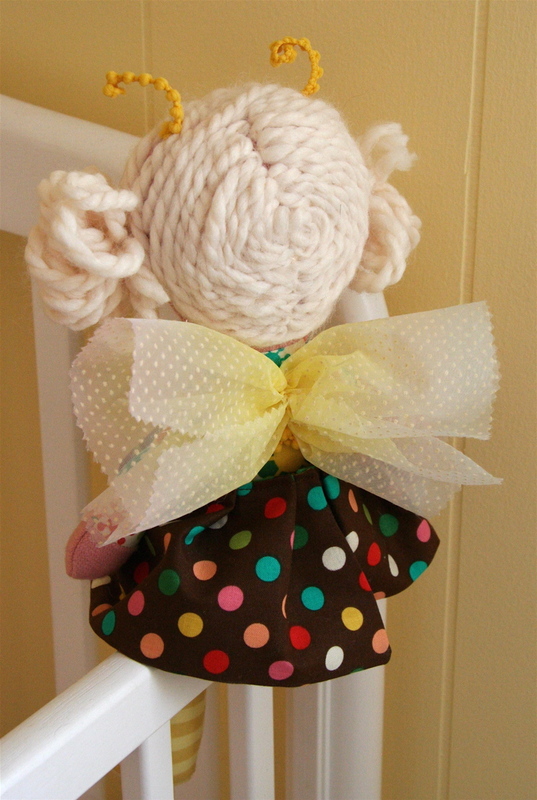 The dollies are super sweet and the hair well all I can say is cute!